If you're thinking about learning to fly paramotors you'll have lots of questions about the sport. In this post I'll answer the most frequently asked questions by aspiring pilots, and you can also check out the blog for lots more information about paramotoring. A paramotor, sometimes known as a powered paraglider, consists of a parachute type wing, that's clipped to a lightweight frame with a small engine and propeller. The frame is attached to a harness that is strapped to the back of a pilot. The pilot then controls the wing with just two controls, and the engine with a hand throttle. 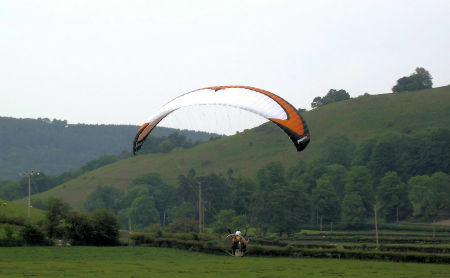 A paramotor can be launched by foot, or they may have wheels. Both types are extremely easy to fly, and they can be flown legally with minimal rules in most countries. Do you need a license to fly a paramotor? In most countries, if you're flying a foot launched paramotor you do not need a license. This includes flying in the UK and US, but you will need an ultralight license if you fly in Canada (Click here for Canadian rules). 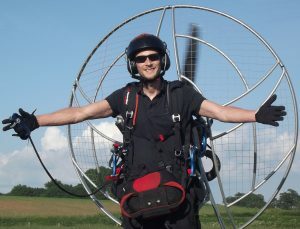 Wheeled paramotors including single seat trikes and quads can also be flown without a license in the UK and US. UK pilots will need to keep the weight below 70 KG, heavier machines and two seaters will require a microlight license. According to FAR 103 for ultralights, US pilots will not be able to carry passengers without an FAA airman certificate. But USPPA qualified tandem instructors are allowed to carry a single passenger for training purposes. Powered paragliding isn't cheap, but it is within reach of most people. For a new paramotor and wing you can expect to spend around £7500 or $9500. The cost of training will be around £1000 or $1300, and there will be a few other things to buy like a helmet, flight suit etc. Although it isn't required by law in the UK or US, you should also get some insurance. It isn't expensive, I pay around £120 per year for full cover. I've got a detailed post looking at the cost of paramotoring, including my annual running costs HERE. Can you fly a paramotor anywhere? You can fly a paramotor almost anywhere! In the UK and US we have a massive amount of freedom, and we can fly in most places without the need for ATC clearance. This applies for most countries, but you will need to check the airspace rules for your specific country. You can find a full breakdown of the rules you'll have to follow HERE. How far can you fly with a powered paraglider? We found out HERE, that with the right paramotor, wing, and weather conditions, you can fly a paramotor over 200 miles on a single tank of fuel! This will vary with your engine type and size, your choice of wing, and the wind speed. How safe is powered paragliding? Powered paragliding is very safe, and statistics show that it's safer than riding motorcycles, or flying light airplanes. We've discovered that poor training, and complacency are two of the biggest causes of injury. You may be surprised to discover that most paramotor accidents actually happen on the ground. You can read all about the biggest cause of injury in the sport HERE. And you can find out how to avoid the most common accidents that happen in the air, and from complacency HERE. Do you need training to fly a paramotor? 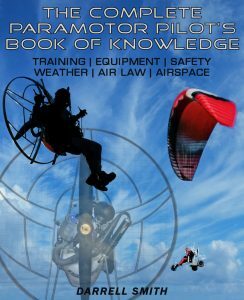 In the UK and US paramotoring is unregulated, which means you do not legally need training to fly a paramotor. There are pilots out there that have skipped the training, and although some do OK, many have been seriously injured, or worse! Find an experienced instructor, and aim to get at least 10 solo flights before completing your training. Training will be very short, and most of your time will be spent ground handling and flying. This means even the best schools will not cover a great deal of important theory, and this will be left to the students to find out in their own time. Get my essential eBook HERE to learn the things instructors are failing to teach their students. How fast can a paramotor fly? The speed that a paramotor can fly depends on the wing, the wind, and the pilot + paramotor weight. The top speed will vary, but you can expect to fly at around 35 mph if there is no wind, and up to 60 mph with a strong tail wind. Learn all about paramotor top speeds, and what limits the speed of a paramotor HERE. How high can you go on a paramotor? The current UK paramotor altitude record is set at just below 22,000 feet. Although it's possible to fly this high with special ATC clearance, and an oxygen supply, it's not common for pilots to fly over 10,000 feet. Flying to this height will burn a lot of fuel, and the climb takes a long time, so most pilots cruise around between 100 and 2000 feet. Is there a weight limit for paramotor? There is a weight limit for paramotors, this is the weight of the machine without its pilot and fuel. In the UK the weight limit is 70 KG, so if you plan on flying a wheeled machine you'll need to check the weight. In the US your machine can weigh up to 115 KG, this means most wheeled machines will be legal. In the UK, if the weight is over 70 KG, but still under 115 KG, the machine will be classed as an SSDR, or single seat de-regulated aircraft. You will then need a valid NPPL M microlight licence. The NPPL M will also allow you to fly twin seat carts. How old do you have to be to fly a paramotor? There is currently no lower or upper age limit for paramotor pilots in the UK or US. But most schools and instructors will usually set their own lower age restriction at 14 years or age. If you're under 14, you can still get yourself a training wing and practice ground handling until you're old enough to fly. What is required to fly a paramotor? All you really need to start paramotoring is a wing, a paramotor, a helmet, and some ear protection. Although these things will get you off the ground, it's recommended that you get yourself a few more things to keep you and your paramotor safe in the air, and on the ground. Take a look at my equipment post to find out the gear that's recommended for all pilots HERE. Mike Byrne from the UK designed and built the worlds first paramotor, coined the name, and took it for it's maiden flight in Essex, during the summer of 1980. Just 8 years later, the German built Pagojet paramotor became the first ever production machine, with a throttle that was controlled by biting down on a pressure sensitive mouthpiece. Can anyone fly a paramotor? Paramotors require about the same level of concentration as driving a car, so if you can drive you can learn to fly. If you have any kind of disability you shouldn't rule yourself out, as there are many disabled pilots. If you have back problems, or if you're an amputee, a wheeled machine will work perfectly. If you can lift 35 KG and run with it, a foot launch paramotor may suit you best. Can you takeoff and land a paramotor anywhere? You can launch and land a paramotor anywhere that you have permission to do so. A simple knock on the landowners door is all it takes to get permission, if they refuse, move on and try somewhere else. There are some places that you will be able to launch and land without permission, like some beaches for example. If you plan on doing this, always check that it's legal before attempting to do so, and always keep a 500 foot distance from people and animals. Another thing to check is the airspace. When you find a place to launch or land, take a look at the airspace chart to make sure you will not be flying into restricted airspace. What if the paramotor's engine stops? If the engine suddenly stops, the paramotor will continue to fly just like a paraglider would. If you have enough height you will be able to attempt a restart. If the engine won't start, you will simply glide down to a safe landing spot and land as normal. This is why it's essential to always keep an available landing option within gliding distance. This is the most frequently asked question on this list, but don't worry; I experienced an engine failure during training and it was easy to deal with, even with just a few short flights under my belt. Paramotoring can be scary in the beginning. Most people have a fear of heights, and it's totally natural to feel this way. When you take your first paramotor flight you may feel nervous about the height, but the height really isn't an issue as you know you cannot fall, and that you have total control. This fear will usually go away after a few flights. Many pilots, myself included take a long time to get over a certain fear that paramotoring can bring. I call this 'paramotor fear', and I've got an whole article dedicated to it HERE. This fear will go away eventually, so don't let it put you off learning to fly. Thanks for checking out my paramotor FAQ section! If you're ready to learn more, check out some of my articles HERE.